Does earlier access to your working capital each week, so you can fund payroll, and ensure you pay your staff on time, sound good? Payroll advance for staffing firms makes this option possible for your staffing company. Consider the following challenges your company faces every week. You have the best staff and you want to keep it that way so how will you find the funds to pay them on time? You want to be able to take on the best individuals for the positions that need to be filled. Not only this, you need to hire the best recruiters on the market, the individuals who understand what your clients are looking for and can communicate effectively to that end. They must also understand the needs of potential candidates, or staff you regularly have on your books. The matching process is a precise science and should be treated as such. As with any industry, keeping on top of the current trends, providing the most professional service possible, and understanding all the unique needs of your staff and your customers is what drives success. One way that really incentivizes commitment is to consistently pay all your staff on time. Some of your customers may be late paying their invoices, potentially causing a cash flow hold up. So payroll advance for staffing firms means having access to your funds on Monday for payroll due on Friday. 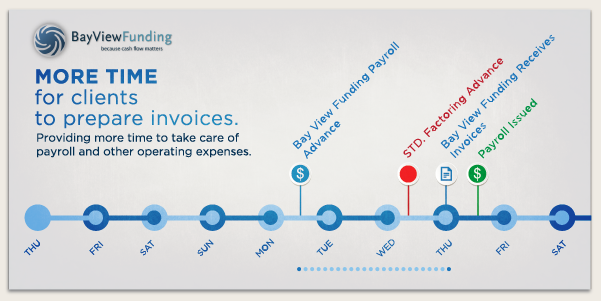 Bay View Funding understands the importance of payroll funding for staffing companies, and the Payroll Advance Program. In fact, they can supply funds up to two days faster than many factoring companies providing a similar service. Providing more time to take care of not only payroll, but also other operating expenses. There is always plenty of competition for your business. Be the best temporary staffing agency, and contact us to find out how payroll advance, and payroll financing can help.